New research indicates that reducing the amount of TV your child watches could lead to them getting a better night’s sleep. The research was conducted at the Center for Research in Environmental Epidemiology in Barcelona, Spain. Scientists there looked at data provided by the parents of 1,713 children. The parents tracked the average number of hours of TV watched by their children each day when the children were 2 and 4 years old in two of the cities. The parents of the children in the third city tracked their kids’ hours of daily TV time when their children were 6 and 9 years old. The parents also reported how many hours of sleep their children got each night on average. They found that when the children were younger, those who watched at least 1.5 hours of TV per day slept less compared to children who watched less TV. 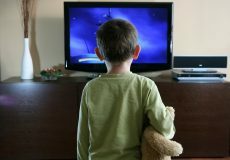 During follow-up when the children were older, some who had previously watched TV for less than 1.5 hours were now watching it at least 1.5 hours a day or more. These children also were found to be sleeping for shorter periods of time than their peers who were still watching TV less than 1.5 hours a day. In the end, the scientists found that more TV and less sleep were linked, even after considering any attention deficit hyperactivity disorder symptoms in the children and their levels of physical activity.